Old Fashioned Fruitcake. See Recipe Below. Based on the cover photo for this post you might be a bit confused. Not only does it not look like an old fashioned fruitcake it in no way resembles a fruitcake at all. Why is that? 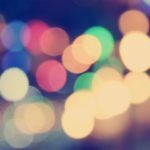 Well I have been trying to create this post for about a year. In that time I had created a folder with all the lovely photos I had take of various old fashioned fruitcakes I have made over the past five years. When I went to look for that folder sadly I could not find it or the copies of the pictures that should be in that folder. 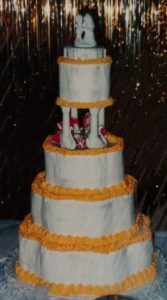 I did find one sad blurry photo from the very first year I made the cake. It is not the prettiest of photos so while it is included below in this post it is not cover photo worthy. Once I get another photo taken this season I will change the cover photo and update the post. Until then you are stuck with something a bit odd but I think in the holiday spirit. As a kid I was subjected to two kinds of fruitcake: store bought fruitcake and homemade loaf pan fruitcake. The first was very sugary and a little gross because of the candied fruit. The second was made by my grandparents who always made fruit and nut breads around the holiday. This fruitcake was made in a loaf pan with a combination of real and candied fruit but because it was a lot of batter shoved into a tight space the cake always came out slightly burnt. Most children don’t like burnt cakes and I was no different. One would think this put me off to fruitcake forever but not so. Several years back I got it in my head that I wanted to make old fashioned fruitcake. At the time I had been watching a lot of British TV shows set in the Victorian era. In the shows there was a lot of mention to various foods eaten and drinks imbibed. Most of the time I just let it all wash over me and enjoy the shows but not that holiday season. That year I wanted to know why everyone found these foods and drinks so tasty. The fruitcake seemed to haunt me the most because of my experiences as a child. I set aside some time to research old fashioned fruitcakes. Some of the internet finds had me a bit confused by the language used. The cookbooks my mom had only had recipes for fruitcakes with candied fruit. After looking at some recipes for cookies in a cookbook Rent-a-Dad had bought as a gift for me one year prior, I happened to find an old fashioned fruitcake recipe that made some sense. The recipe used real dried fruit, marzipan, and fondant. It sounded the closest to all the research I had done on good old fashioned fruitcake. I didn’t particularly agree with all of the fruit being used such as prunes or the fruit being left out like cranberries or cherries. So I made some adaptations to the recipe. When I set out to make the recipe I realized I made one strategic mistake. I was making the fruitcake one week before Christmas and the recipe said to make it three weeks out so it can be properly soaked in rum. Well as I had been talking about this recipe for weeks my family certainly expected that I would deliver. So I made the fruitcake and instead of brushing rum on the fruitcake once every week, I brushed the same amount on the fruitcake over the course of three nights rotating the cake every night so the rum wouldn’t sink to the bottom and be more likely to really soak in. Another change that I made was using my dad’s recipe for white frosting instead of store bought fondant. When the cake had soaked long enough I brushed it down with marmalade (instead of apricot preserves) before spreading white frosting on the cake. I then rolled out the soft marzipan I had purchased and layered it on top. 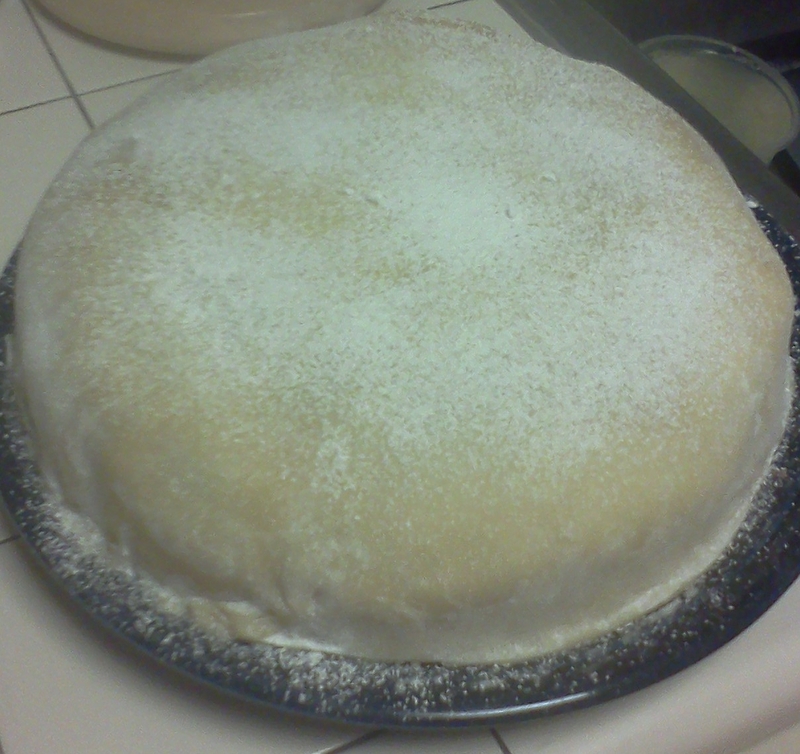 The crowning touch was dusting the marzipan with powdered sugar to give the cake a snowy appearance. A day later came the moment I had been dreading: cutting and serving the cake. The cake, weighing between 10 and 20 pounds, cut beautifully and looked like something straight out of a Dickens’s novel. It was enough cake to serve a small army. When I cut the cake several slices adorned each of my aunt’s cookie platters that I gave as gifts that year. The tasting of the cake at our home was so enjoyable that even my husband who hates fruitcake loved it! Then came the phone calls from my three aunts. The fruitcake slices were a hit at each of their homes. Their children who all hate fruitcake had even stolen bites and asked for more. All of my uncles were furious because they wanted the rum soaked fruitcake with my dad’s frosting! Thankfully I had enough fruitcake that I could smuggle them each down a slice all of their own. The following year I received so many questions as to when I would make my old fashioned fruitcake that I knew this was now a family favorite! In subsequent years making the old fashioned fruitcake has also been bitter sweet as all three of my uncles have since passed away and I remember how each of them had looked forward to the second year I made this cake. I still make this old fashioned fruitcake even though it now has a gluten free twist and it is still as good as the first year I made it! Before starting this recipe a 10” or larger spring form pan is needed. If not available use a 10” or larger round cake pan that is at least 3” deep. Cut out a piece of parchment to fit the bottom of the pan. Also cut three 4 inch tall pieces of parchment paper and set to the side. Grease the sides of the pan and line the sides with the previously cut parchment paper. Make sure the pieces overlap (may need to use a little more grease to get the parchment paper to stick). Preheat your oven to 300 degrees. * a good substitute for fresh zest is dried or even trying a ½ teaspoon of lemon flavoring. If making a substitute I prefer to use 2 packets of true lemon or an extra tablespoon of lemon juice. Whisk together the flours, salt, and spices. Set to the side. Chop the apricots and dates. Add in a separate bowl with the remaining fruit. Add the rum, lemon juice, zest, and marmalade. Let soak for 30 minutes. Using an electric mixer, cream the butter until smooth on a medium high speed. Add the brown sugar and vanilla. Once thoroughly mixed add the eggs one at a time and beat for an additional two minutes. Scrape the sides of the bowl at least once during the process to ensure that all of the butter and sugar are mixed with the eggs. Gradually add the flour and spice mixture at a reduced speed. Once the flour is fully incorporated beat for a minute. Then slowly begin to fold in all of the fruit mixture. Continue to stir in the fruit until it is completely distributed throughout the batter. Pour the batter into the prepared spring form pan being careful not to knock down the parchment side liners. I tend to scoop the batter one spoonful at a time into the pan until a good layer of the batter is holding up the parchment side liners. Make sure the parchment paper continues to stay about 3” above the top of the pan. The parchment side liners ensure that the fruitcake will not bake over top the pan and burn in the oven. Set the filled pan on a baking sheet and place on a rack in the center of the oven. Bake for 2 hours or until cake is firm to the touch and golden brown in color*. The top may be slightly cracked. When a toothpick is inserted in the center it should come out clean. Once the cake is done, pull from the oven and set on a wire rack to cool for a minimum of 30 minutes. After the cake is room temperature or cool to the touch release from the pan and let the cake completely cool. Once cooled completely place the cake in a container (I use a deep drying pan) and brush with rum. Wrap the cake in plastic wrap or store in an air tight tin. Once a week, for three weeks, brush the top of the cake with ¼ of rum. I never have enough time for this step so once a day for three days I flip my cake and brush with rum so the rum has a chance to fully distribute through the cake. Remember to re-cover the cake so it does not dry out. Once the cake has soaked for a suitable amount of time, transfer the cake to a plate. Brush the cake with ¼ cup (or more) of marmalade. Evenly spread the white butter-cream frosting over the cake. Let sit while you roll out the marzipan. Lightly dust a pastry cutting board with powdered sugar before rolling the marzipan out to a ¼ inch. Make sure that as you are rolling out the marzipan that you are doing so in a circle pattern of at least 15” in diameter. When the marzipan is the desired thickness carefully roll the marzipan over the rolling pin to move to the cake. Gently lay on the cake. Smooth the marzipan out to remove any air-bubbles. Trim excess marzipan from the bottom of the cake and dust the entire surface with sifted powdered sugar for a “snowy white” look. White fondant can also be used to create snowflake cutouts to decorate the cake with. * If the fruitcake is browning up quicker than expected then between the 1.5 and 2 hour marker I have turned the oven off and let the fruitcake sit in the oven for a full hour. This is not a step I recommend to a new baker. This is a gutsy move and may end up with an under-baked cake. Sugar Cookie: Classic and Gluten Free Inspiration. See Recipe(s) below. 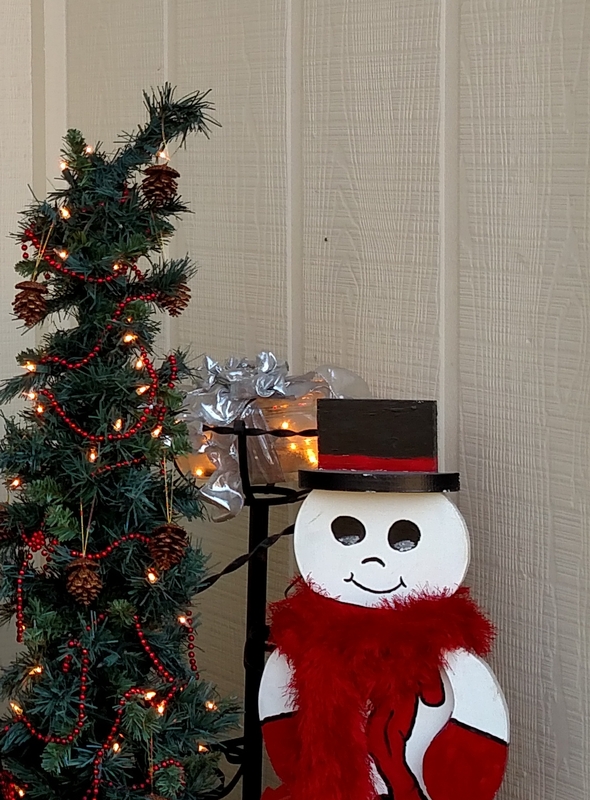 The classic sugar cookie recipe included in this post is one that has been passed down from my grandmother to my mother, then from my mom to me and the grandchildren. 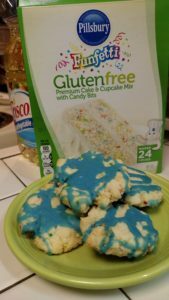 The gluten free recipe options have been recent finds as I have had to changes to my diet and actually began to miss some of the cookies from my childhood. My mom has always loved sugar cookies but they have always been my least favorite cookie. So at first when my diet changed I did not miss them. The biggest reason this has been my least favorite cookie was the after taste baking powder can leave behind when you finish the sugar cookie. As I got older sugar cookies were more trouble than they were worth. I could never get the sugar cookies to retain their shape from the cookie cutter until I started pre-coating the cookie cutters with something like PAM. It didn’t seem to matter if I made the sugar cookie as a drop cookie or shaped, I was upset of the sugar cookie didn’t come out buttery. My family recipe calls for Crisco. When I tried using butter the cookies came out harder than a rock until I figured out that if I used butter helps but refrigerate the dough for 30 minutes prior to baking to retain softness. The final straw was that no matter how hard I tried I always burnt the edges of my sugar cookies. I felt like a sugar cookie failure because my mom and dad always made the best sugar cookies. When I eat a sugar cookie I want it to turn out like all the gourmet cookies do: plump, buttery, a little crunchy on the outside but melt in your mouth when you get to the center. I could never get my sugar cookies to be like this. That is until this year when I tried two gluten free store-bought boxed batters. During the years in which I was the business manager for a choir I never had enough time during the holiday season to make all the cookies from my youth. I started to keep cake and brownie mixes on the shelf that I could turn into gourmet style soft batch cookies. My favorite was Duncan Hines yellow cake batter. With the recipe on that box I could transform the cake mix into snicker doodles which were always a hit at the annual holiday party my church held. 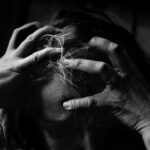 This year I missed the annual church party because of family crisis. I also missed those drop cookies because I am trying to live gluten free (makes my life less painful). To cheer me up we decided to take the kids in our lives out to look at holiday lights. As per our holiday light tradition we take cookies and hot coco to enjoy in the car while driving. I didn’t have any drop cookies I could easily make. So I took a gluten free cake batter and made a few adjustments to make sugar cookies. This was the best sugar cookies I had ever made! They ticked off every box on what I think makes a good sugar cookie: plump, buttery, a little crunchy on the outside but melt in your mouth when you get to the center!! Success! Then I found out that Pillsbury had an actual boxed mix for gluten free sugar cookies. So I tried that boxed mix. Those were also quite delightful but I found my original batch to be more my taste. So below you have the option to take a gluten free cake mix and turn it into sugar cookies or to just buy the gluten free sugar cookie mix. Either way if your sugar cookie taste is like mine you can’t go wrong. Now if you really want to make a rolled sugar cookie dough then sadly I have yet to find the perfect gluten free recipe. This year when I made the gluten free sugar cookies I found out something I didn’t know, my mom and dad always looked forward to my slightly burned sugar cookies. 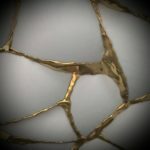 While I like my edges crisp they liked their edges slightly burnt but felt they always over baked their cookies when they tried to go for this option where as mine always ended up with burnt edges but perfect centers. Life is funny sometimes with the different perspectives we each have of the same memories. Before starting grease your cookie pans (or line with parchment paper). Preheat your oven to 375 degrees. Thoroughly cream together the shortening, sugar and vanilla. Add egg and beat until light and fluffy. Stir in milk. Set aside. Sift together all the dry ingredients. Once sifted blend the dry ingredients into the wet ingredients until thoroughly mixed. Baking Instructions 1: If doing as a drop cookie, by the teaspoonful drop the dough onto greased cookie/baking sheet and bake at 375 degrees for 10 to 12 minutes. Baking Instructions 2: If making as a rolled out shaped sugar cookie then wrap the dough in saran wrap and refrigerate for a minimum of 1 hour up to 24 hours. On a lightly floured surface place the refrigerated dough and roll to about ¼ of an inch thick. Remember to slightly grease all sugar cookie shapes so the dough does not stick to the cookie cutter. Use a cookie spatula to move the unbaked cookies from to the baking sheet. Bake at 375 degrees for 10 to 12 minutes. Grammy Knauss’s Note: This is a great basic recipe. You have the plain sugar cookie you can sprinkle with sprinkles from store or you can make the recipe a bit different by adding raisins or orange rind shavings (or teaspoon of orange juice) or lemon rind shavings (or teaspoon of lemon juice) or broken up peppermint pieces or anything you think might appeal to you. You can add a tablespoon of peanut butter to the mixture. You can frost them after they are cooked and make cookie “sandwiches from them”. Before starting line your cookie sheets with parchment paper. Preheat your oven to 350 degrees. Combine the cake mix with the oil and eggs until the mixture is moistened. The mixture will seem a little more wet then expected for cookies. Use a cookie scoop to have the cookies be uniform. Roll the dough in your hands before placing on the parchment lined cookie sheets. Bake in the oven for 10 to 12 minutes or until edges are set. Allow to cool for about 2 minutes before placing on a cookie rack. When cookies are thoroughly cool they can be decorated or eaten as is. Our family enjoys a coating of royal icing on sugar cookies. Right now deep blue in honor of Frozen seems to be the color of choice. Enjoy! * I believe this recipe is just slightly richer than the gluten free boxed sugar cookie mix. However, if strapped for time, I still quite enjoyed the Pillsbury Funfetti Gluten Free sugar cookie mix. Ever since I was a kid I was crazy for pumpkin this and pumpkin that. From the moment I started really baking on my own I was adding pumpkin to every recipe I could think of starting with pancakes. As an adult my affinity for pumpkin has not really waned much. I even have my nephew hooked on pumpkin flavored things. 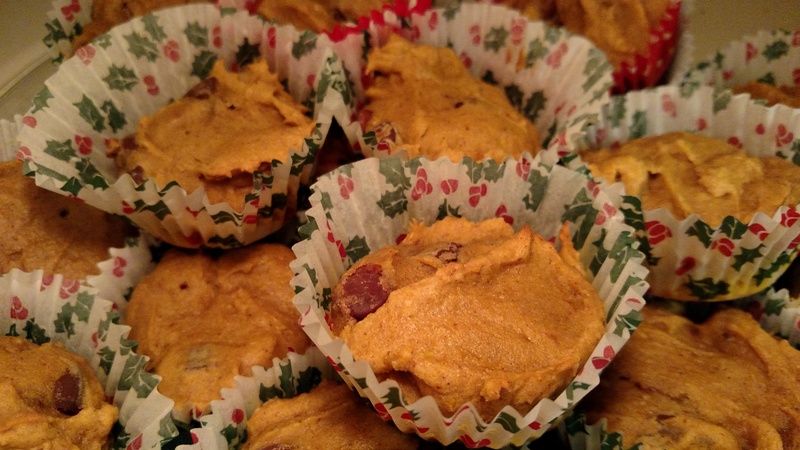 Last year I shared several of my most favorite pumpkin recipes adapted for a gluten free diet. The chocolate chip pumpkin muffin recipe shared below is a slightly adapted version of the already shared gingerbread muffin recipe. Although I love to watch Food Network in all of its glory I have my favorite cooks and chefs. In the past couple of years I have narrowed down my cooking shows to Dinners, Drive-Ins & Dives; Halloween Wars; and the baking championships. My other favorite cooking show is from across the pond, the BBC’s The Great British Bake-Off. The reason why these shows call to me while others don’t is familiarity and comfortability. Like those TV shows, while I love cooking, baking and trying new recipes I also have my favorite recipes. This is the comfort food that I can make without really thinking about it. Since our Stinkerbell started eating solid foods, my gingerbread muffin recipe has become one of those items. This year I hit a rough patch. At first I didn’t want to bake because of the exceptionally warm fall weather and then because of the forest fires in our area. Once the weather returned to normal (ish) and the fires were under-control my household was turned upside down with illness. My mom developed shingles and I had a bad sinus infection. My mom’s condition is certainly more serious and meant a lot of doctor visits to specialists. In all the crazy scheduling and upheaval I needed some portable breakfast food that I wanted to eat on a daily basis. Not only did I need something quickly that I could grab but something that wouldn’t upset my stomach in the morning when I took my antibiotics. My initial go to was my gingerbread muffins but my nephew and niece were visiting. While they both like pumpkin they don’t like raisins. However… they love chocolate! So I had this brilliant idea to change my go-to recipe with lessening some of the spices and adding milk chocolate chips. The change was a success! Since then I have made three batches of chocolate chip pumpkin muffins! This pumpkin muffin recipe has been a real life saver for me this past month. These pumpkin muffins make a great breakfast item as well as a mid-day snack. Because this is a homemade item you can control how much spices and sugar goes into the batter. Play with the recipe to suite your taste buds and needs! 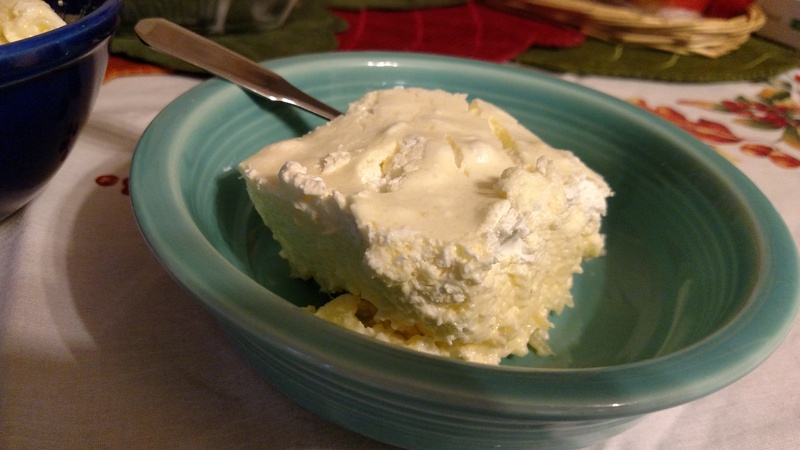 Melt the margarine in a microwave safe container for 20 to 30 seconds and set aside. Combine all the dry ingredients and stir until all the spices are evenly dispersed. In a separate mixing bowl combine the eggs and brown sugar and blend using a hand mixer. Add in the pumpkin and melted margarine. Slowly add in the dry ingredients until thoroughly mixed together then fold in the optional ingredients. Spray the muffin tins with Bakers Joy or use cupcake paper cups in the muffin tin to easily remove the cooked muffins. Use a ¼ measuring cup to fill each individual muffin tins 2/3 full. Bake for 20 to 25 minutes or until a toothpick once inserted into the center of a muffin comes out clean. *If fresh pumpkin (rather then canned) is being used then you will want to increase spices according to your palate. Fresh pumpkin can often be a little bland and therefore additional spices are needed for a rich flavor. ** There is often more water in freshly cooked down pumpkin (if boiled and not roasted) then in the canned pumpkin. If fresh pumpkin (boiled) is being used then only 1/8 cup of water may be all that is needed. This fall has been very different from the ones I am used to. Not only was I even busier than normal but the weather was far to warm for me to consider baking or cooking. Sadly as the weather began to cool off in early November our area was experiencing wildfire after wildfire. This meant my serious baking and cooking hiatus continued. A little bit of rain last week not only made the air more breathable but put me in the right mood to bring out my cookbook. 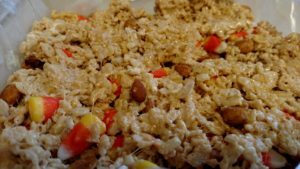 The dessert below only involves a little bit of cooking but is a favorite recipe enjoyed at some of our special family gatherings from Thanksgiving to the 4th of July. When this dessert is made it is with the knowledge that we need to make enough to feed a small hoard since it disappears quickly. Since the amount is more important than decoration our version of this yummy dessert has a tendency of looking a little plain. If made using a decorative fruit mold, this dish can be that special dessert to showcase at a church picnic! This is a special dish that my paternal grandmother would make when she visited. Most years we only saw my paternal grandparents about three or four times during holidays or other special occasions. So this is a dessert that we all looked forward to at every visit. When my grandmother passed away my biggest regret was that I did not inherit her cookbook. I am thankful though that about ten years before she passed that I asked for several of her special recipes like this one. My dad said that my request brought tears of joy to her eyes as she is not my biological grandmother but that I accepted her as such. Any words (and photos) that I share can not properly express how yummy this dish is. As a child I was a very picky eater. Two things generally deterred me from trying lots of foods: appearance and texture. If I could get past the appearance of a dish generally the texture would put me off. My one exception to the odd appearance and texture rule was my grandmother’s pineapple salad. Once I tasted it I could never get enough. It certainly didn’t hurt that one of my favorite fruits has always been pineapple. In this post I have included two versions of this recipe. I have the original as my grandmother made it (as taken from her hand written note card) and an adaptation that I make. My adaptation came around as I had to deal with several challenges from time and space to make the dish to dealing with how the ingredients were packaged at my store. In both recipes we opt to use lemon jello but lime jello or a combination of lemon and lime can be used. I hope my pictures of this dish do not discourage you and that you enjoy this recipe as much as our family has! Over mediume heat, in a saucepan, heat the crushed pineapple and sugar for about 5 minutes. Let cool to room temperature. Mix together the jello and hot water. Stir thuroughly until the jello has disolved. Cube the cream cheese and add to the the jello & water. Using a hand mixer, thruoughly mix until the cream cheese is broken into very small pieces or is creamed. Add cool whip into the jello mixture one spoonful at a time. Fold in the pineapple mixture. Use a 8×12 inch pan to set the mixture in. Refrigerate until set. 1. Heat together crushed pineapple & sugar for 5 minutes. Let cool completely. 2. Mix together jello and hot water. Stir thoroughly. Let cool but do not chill. 3. Using cooled jello cream your cream cheese. Do this slowly. 4. Add cool whip spoonful at a time. 5. Now fold in your pineapple. If you aspire to create a fancy jello salad check out the picture and recipe found on this page: Fruit Salad. 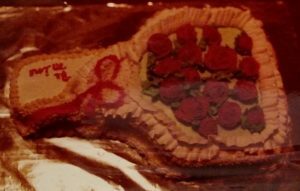 The jello salad on the shared link is prepared with a jello mold and reminds me of the salads that used to grace some of the fronts of my grandmother’s cookbooks and food related magazines. One of my favorite pies of all time has been a French apple pie. This was not a pie my family had at any holidays. Rather it was one my dad would order from a local bakery for a concession stand he ran for our bingo night at the church. Even though I helped my dad cut and set out the pie it was only once in a while that my dad would buy me a slice for us to split. This was also one of my dad’s most favorite pies as well. What is it about this pie that we loved so much? Why, the layer of royal icing topping off the pie, of course. One would think that this extra bit of sugar might make the pie a bit on the sweet side but it never was. It was always just the right combination. In so many ways it was like having the best part of a cake with the best pie on the planet. Sadly the bakery that made the French apple pie went out of business decades ago. My dad never found another bakery in our area that made pies quite like that one. Even though our family made homemade apple pie for some reason we never made French apple pie. My dad and I would talk about how much we missed that pie. Over the years my mom would buy other kinds of apple pies to see if we liked them as much. Truthfully my family loves most types of pies but I would always compare them to that French apple pie. This Thanksgiving, instead of making a regular apple pie or purchasing a pre-made pie, I decided to make a French apple pie. Rent-a-Dad, never having ever tried a French apple pie but loving my dad’s royal icing recipe, was totally on board to try this “new” pie recipe. Using my own spiced apple pie filling recipe, a store bought pie crust (gluten free) and my dad’s recipe for royal icing, I set out to recreate a childhood memory. So how did it turn out? Well within the first 48 hours only a ¼ of the pie remained. While the filling was a little spicier than the one from my memory it was still everything I ever loved about this particular pie. 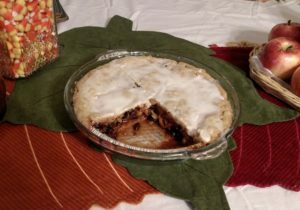 The pie crust recipe included is not the one I used, as I am trying to stay true to the FODMAPS diet as much as I can, but is a family recipe that I never want to loose. If you love to try new types of pie and have never had French apple pie before I hope you give this recipe a try! The recipe is for a standard 8” or 9” pie plate. If using butter freeze until stiff but not hard. About 15 minutes. When using butter use a grater to make the butter pieces small enough to cut into the flour with minimal manipulate. If using shortening cut in with pastry a blender until pieces are the size peas. (For extra tender pastry, cut in half the shortening till like cornmeal, then cut in the remaining shortening till like small peas). Sprinkle 1 tablespoon water over part of the mixture. Push this to side of bowl. Repeat steps 3, 4 and 5 until all is moistened. 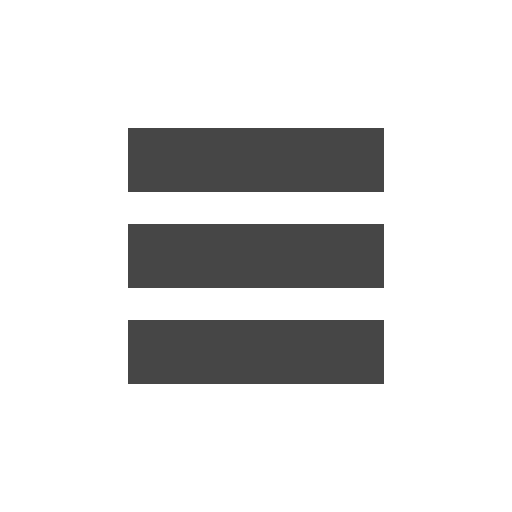 Flatten on lightly floured surface by pressing with edge of hand 3 times across in both directions. Roll dough from center out to edge until 1/8 inch thick. Used for pudding pies and lemon meringue pie, pumpkin and sweet potato pies. Trim ½ to 1 inch beyond the edge of pie plate. Fold under and flute (pinch) edges – you need both hands for this- using index finger of the right hand push the pie edge into wedge made by index finger and thumb of the left hand. Do this all the way around the pie. Prick bottom and sides well with fork. Bake at 450 degrees fro 10 to 12 minutes or until golden. Used for fruit pies such as apple, cherry, blueberry, etc. Use one shell for the top and one shell for the bottom. Fit rolled pastry into pie plate. Trim the pie shell even with rim of pie plate. Fill the shell with enough fruit filling to either be level with edges (pre-cooked or canned filling) or slightly domed if fruit filling is fresh/raw. Lift the top crust by rolling it gently over a rolling pin. Then unroll it loosely over the well-filled pie. Trim top crust to ½ to ¾ inch beyond the edge. Tuck top crust under edge of lower crust. Flute the edge as for a single crust. If you use a canned filling use baking directions they suggest. For from scratch pies follow the directions below. *My family loves the full spice profile that the brown sugar and this amount of spice adds to the pie. 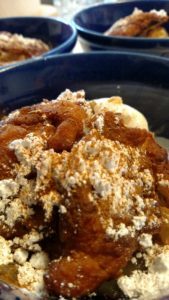 If your family likes a more traditional apple pie flavor then use 2 to 3 tablespoons of white sugar and half the amount of spice in the ingredient list. Place the diced apples in a mixing bowl. Add the brown sugar, sugar and all of the spices to the apples and toss. The apples should provide enough natural juices to let the sugar and spices coat the apple pieces. If the apples won’t easily coat with the sugar and spice mixture then add lemon juice. In a large skillet melt the 3 tablespoons of butter over medium hear. Add the apple mixture, dried cranberries and raisins. Continue to stir the mixture around in the skillet letting the sugar melt and the apples begin to break down (sweat). Check the crispness of the apples every few minutes. You want the apples to be slightly tender and the dried fruit to be plump/slightly re-hydrated. If the syrup forming from the sugar begins to burn add more butter to the pan, one tablespoon at a time. Once the apples are to your desired tenderness turn off the burner and remove the frying pan from the heat. Add the mixture to the pie shell until slightly over filled. Cover with second pie crust. Bake for 20 to 30 minutes until crust is golden brown. Store any of the remaining pie filling in an air tight container in the refrigerator for up to a week. When the pie is fully cooled, mix milk and powdered sugar. Pour over the crust starting in the center of the pie and working outwards. The idea and recipe below are great ways to turn stale bread and week old dry donuts into something yummier than its original purpose. You may want to skip my narration this week as it has a more somber tone as the ability to have stale bread is something some people literally die wanting. The motivation behind my narration this week is a combination of growing up being a thrifty cook and a recent reminder from my mom to be thankful for everything I have. Our dinning room table is more than a place to gather for meals. Fresh bread, tomatoes, and apples can be found there as well as a bowl of treats, a pile of “homework” and sometimes my purse. We probably do less eating at our table as we do talking. Our dinning room table is a social place. We gather around it to talk about our day, get chores done, as well as to see what is new and yummy. Sadly our dining room table also collects things. With our busy schedules we do eat less there as a family and more as individuals. As such one end of our table collects pastries and breakfast items. At least once a week I go through the items on our table to make sure they are not stale or moldy. 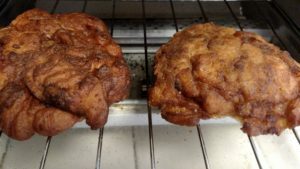 About a week after going apple picking with my family in October I was handling this task when I found two very dry apple fritters. I was about to throw them away when I sat down and had a good long think. As a child living on a US base in Morocco my mom witnessed the local children eating out of their garbage because they did not have food. My grandmother already thought she was a savvy and thrifty cook as she grew up during the great depression. She saved her bacon fat and used drippings to make gravy. When it came to removing meat from bones to get the most out of a meal my grandmother was meticulous. So any food scraps that got thrown away were not much of anything but there were still children digging for them trying to make a meal out of next to nothing from their trash. Whether you can or can’t imagine this scene let me tell you it has stuck with my mom through her whole life. When asked about her life in Morocco she will tell you how amazing it was. In the same breath she will also tell you about the abject poverty she saw and what we (Americans) take for granted. Something else she will tell you is how she did a lot of growing up while she lived in Africa. After my mother, her sisters and my grandmother witnessed children eating out of their garbage they were determined to find out what they could do. My grandmother spoke to the children and their parents asking them to knock on their door instead of eating out of the garbage. What my grandmother decided to do was create scrap bags that could be picked up at her back door. Everything was separated out from used coffee grounds to potato peels she decided not to fry up. Sometimes, rarely, it also involved stale bread. It may have shocked them that the very tiny food waste they had could still be used for someone else’s meal but it also opened their eyes as to what true poverty was. After I had my good long think I said a pray for those who don’t have much, thanked God for what my family has, and decided the stale apple fritters maybe had a second life in them after all. If you want to learn more about giving your meals and stale bread a second life just do so cautiously and consciously. Taking week old stale bread and turning it into bread pudding is much safer then trying to give a week old pot-roast new life. Some food MUST be thrown away. Some things are way too moldy and gross to even contemplate something other than the garbage bin. Reading this may spark thoughts and ideas about socially conscious eating. There is no one good definition to what this movement means. For most people it is about knowing where your food comes from or the impact it has on the environment. For our family it is about having a LARGER view of life from being thankful for what we have to making an effort to cut down on our carbon footprint or attempting to reign in excessive consumerism. So what did I do with my week old apple fritters? I made fritter toast of course! Sometimes my family likes a little “crunch” with their ice cream dessert. I sliced my fritters thin enough to toast and lightly toasted each slice. While the fritters were toasting I pulled out my already made deconstructed apple pie. I heated enough for three servings, gave each bowl a scoop (or two) of vanilla ice-cream and added the fritter toast, sprinkled on powdered sugar and topped off with caramel sauce. Using the week old apple fritters this way was a success! Using an electric mixer, beat sugar and eggs until creamy. Add vanilla, spices, and milk. Cut the bread into pieces. Add bread to mixture and let soak, about 5 minutes, until soft. Fold in raisins. Grease 9×13-inch pan. Pour mixture into pan. Cook in preheated oven (350 degrees) for 30 minutes. NOTE: For softer raisins pre-soak raisins in boiling water for five to ten minutes. Drain liquid and fold in raisins to the pudding. On low heat, melt butter. Once melted add 1 cup of confectioners sugar mixing thoroughly. Remove from heat and let cool to room temp before adding the brandy. Suggested use: The sauce will harden like royal icing as it cools. Poor entire mixture over the bread pudding within 20 minutes of bread pudding being removed from oven. A few years back a couple of friends convinced Rent-a-Dad and I to try making our own candy corn trail mix. The reasoning was that the mix tasted so much like a Payday candy bar that we couldn’t refuse. Since I am not a huge Payday candy bar fan I was a bit skeptical. 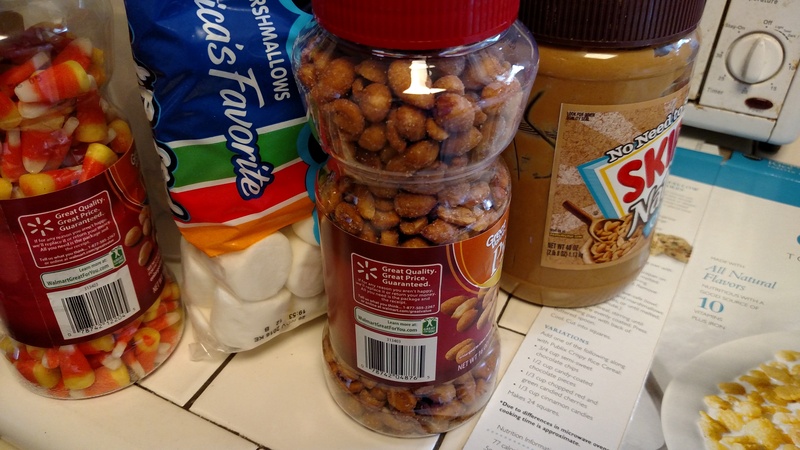 Rent-a-Dad and my mom immediately jumped on the idea so we bought a canister of unsalted peanuts and candy corn. I had to admit that it was quite yummy and in quite a few ways better than the candy bar. We even tried other peanut/candy corn combinations and found that we really liked the honey roasted version. At some point this past spring when I was making my special Reese crispy treats, Rent-a-Dad was thinking of all the flavor combinations I could make with crispy cereal and candy. That was when he had an “ahah!” moment and begged that once fall rolled around that I try the below recipe. I was skeptical about this flavor combination so I did not make a HUGE pan of the treats. Once again I have to admit my skepticism was ill placed. Rent-a-Dad is a HUGE fan of this recipe! 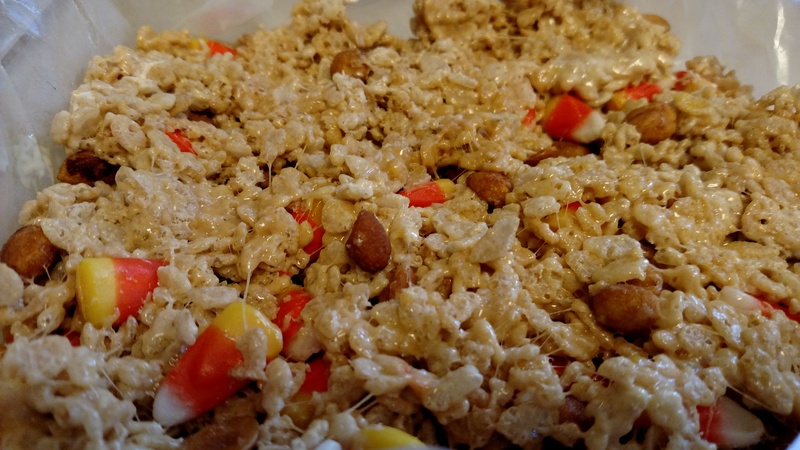 Since candy corn is an acquired taste I would suggest making this flavored cereal treat dish in the batch size I have measured out below… At least until you know if your family is a fan or not. With margarine, grease your baking pan and a large wooden spoon. Set aside. I use spray butter as it’s a nice flavor and easy to apply. In a large microwave safe bowl (I use a ceramic mixing bowl) measure out 21 regular sized marshmallows and 2 tablespoons of creamy peanut butter. Heat in the microwave for about 1 to 1 ½ minutes until the peanut butter looks shiny and is sinking into the now extra fluffy melty marshmallows. Stir the marshmallow and peanut butter together. Add in the 3 cups of crispy rice cereal. If the spoon proves difficult get your hands dirty and mix the ingredients together. 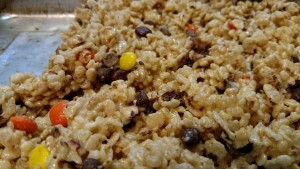 Once the marshmallow mixture is evenly dispersed through the cereal add in the peanuts and the candy corns. When evenly mixed spoon and spread the mixture into greased baking pan. As I have said in previous posts, once warm weather strikes my oven and stove are used very infrequently so under normal circumstances baking is out of the question. Why? I remember as a child our house, which lacked central air, was always unbearable over the summer so we ate mostly sandwiches, cold finger foods, fresh fruit, salads and anything we could grill because to cook on the stove or in the oven was out of the question. As an adult I choose to follow the same pattern since our home has a very open floor plan so heat from an oven can be felt throughout the house. This means there are very few reasons I will turn on my oven. Three big reasons are my niece and nephews birthdays. They are all high on the “I’ll do anything for them” list and baking their birthday cakes has certainly been a labor of love. I was one of those kids who was constantly at my parent’s knees when they were doing anything that seemed interesting such as their hobbies. For my mom if I wasn’t tagging along to some church or school function and committee, I was sitting at her feet while she was sewing at our dining room table, begging to file some piece of research she had completed on a book she was writing, peaking over her shoulder at some floor plan she was drafting (for fun), or some other artsy craftsy project she was working on. My dad was a man of a few interests. One of his passions was making and decorating cakes. He had taken the Wilton classes back in the late 70s. Once he received his certificate he was always making cakes for church functions and church members. I looked forward to those occasions where he would come home from work and put on an apron. I knew it meant fresh unused leftover cake fragments and the yummiest frosting. It also meant I got to see the colors he developed for the cakes he was designing. Yeah a lot of the cakes he made using Wilton pans but generally it was to get a desired shape rather then for the original use the pan had. Case in point: there was a rocket ship pan that my dad would use to make a church cake. 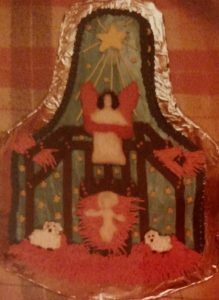 It was the correct shape for a church with a steeple just like our own church had, therefore the perfect cake for an annual church picnic that celebrated the founding of our church. All of the cakes my dad designed were creative. I loved them all but I specifically loved the ones he designed for my birthday. It was a cake all for me, yeah I had to share but it was something designed with my likes in mind that was for me, not just scraps from another cake or a slice at an event. There is something to be said for having ones very own cake with scraps and leftovers. As a kid it feels like wining the lottery. It’s just that special. As I grew up my dad made fewer and fewer cakes for our church, for church members, for family members… for even me. The very last cake my dad designed was for my wedding. The big reason he stopped making cakes was his arthritis. He felt like his frosted designs were just not right and he wanted people to remember his good cakes not his bad ones. I had to beg him to make my wedding cake. It was what I had always dreamed of as a child. As an adult I told him I would deal with anything he made me. I just wanted one more cake. When I gave him colors and let the design be up to him he looked through all of his books and the dog eared pages I must have bent as a child. Because his hands were failing him, he had my brother help. It was a beautiful gift from them both and I loved it. The only thing that made me sad was that my dad had taught my brother how to make and decorate cakes. My brother made me a cake for my twelfth birthday. He had inherited my father’s talent. I was sad because as much as I loved my dad’s cakes, I wanted to make them as well. It wasn’t until 2009 that I finally convinced my dad to sit with me and teach me what he knew. My parents had moved down to Tennessee in 2007 to be closer to me. Sometime between 2007 and 2009 I had unpacked his cake pans and hung them on one of the walls of their garage in a similar fashion to what my dad had done in our pantry back in Maryland. I loved seeing the cake pans every time I opened their garage. It was like getting a piece of my childhood back. Over the summer of 2009 I found myself with some extra time and was helping my parents out with some projects. My dad pulled me aside to ask if I would box the cake pans up so he could either send them to my brother or sell them; mind you he had already sold off quite a few years prior when he stopped making cakes. I wanted to cry. In fact I think I may have cried. 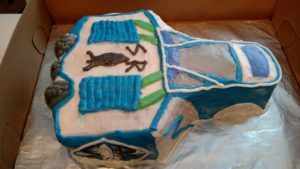 I couldn’t understand why my brother was worthy to learn how to make and decorate cakes but I wasn’t. When I shared this with my dad he sat there looking at me for some time before he said “I never thought you cared.” Of course I cared. I told him how some of the best childhood memories I had were around the hobbies he loved from photographing our ball games to making cakes. It hurt that my dad had shared both hobbies, gifts as I think of them, with my brother but not me. After sharing my feelings with my dad he told me that he would instruct me on what to do but that I would have to do a lot of the learning on my own because he just couldn’t get his hands to work right. I still felt honored. That fall I baked so many cakes and made endless tubs of frosting. Somewhere between my wedding and 2009 my dad had lost his frosting recipe which was an adaptation of the one Wilton now shares online. My dad told me that he found the adaptation he made worked well for the cakes he made and that each baker will make adaptations to suit the situation. So he had me make tub after tub of frosting to see if we figured out what he had done all those years ago. 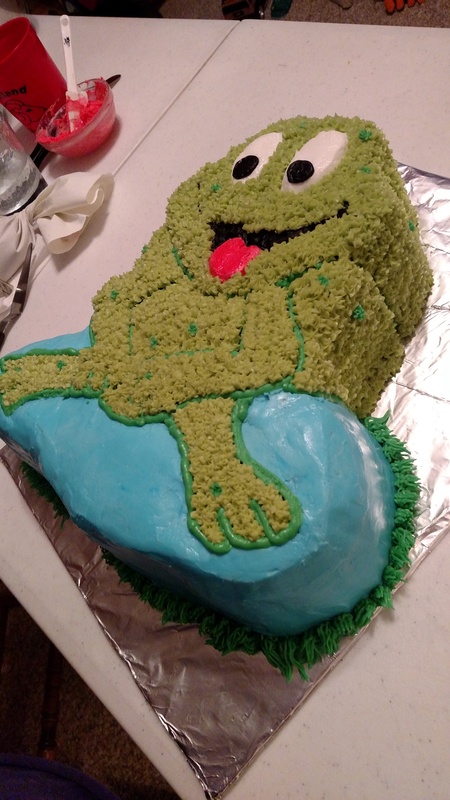 Once we got a frosting he approved of then he started me on dying techniques and frosting cakes. I would send cakes to work with my husband, to play practices, play openings, take them to parties we were invited to, to our vet, the doctors office… and give away so much frosting you would think that was all I knew how to make. I loved it. I don’t work for a bakery and I am not an expert. I just love to make cakes and pass on the joy I feel when I bake with those that feel joy in receiving the yummy confections. This generally means I only bake for those I know will appreciate the cakes like my niece and nephews. 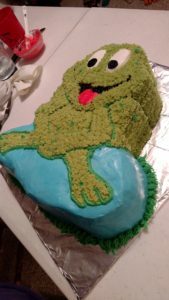 Over the past several years my nephews have put me up to the challenge of making bigger and more interesting flavored cakes. Last year I experimented with a pudding center for one while this year I adapted my white frosting base to make a peanut butter frosting and used it with peanut butter cups to fill a cake. One of my nephews has been begging for a castle cake for months. 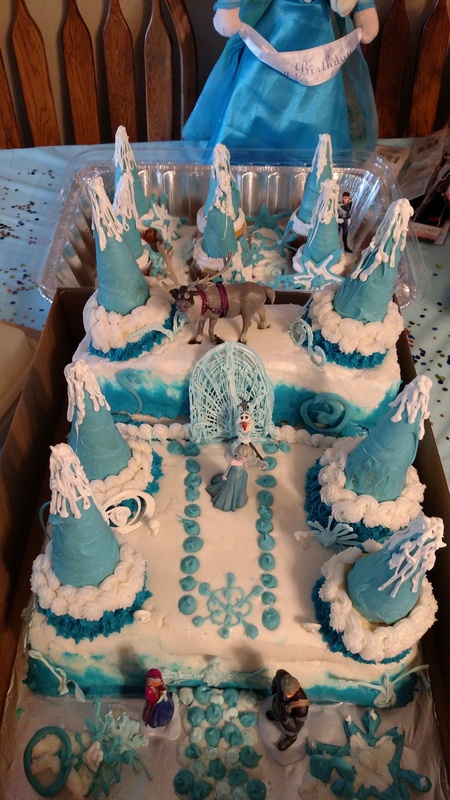 I had this castle design all in mind that I had to adapt at the last minute because the cake was too brittle and even with the proper pegs inserted in it to keep the layers together it kept wanting to slide off… so the castle evolved into more of a mountain lair. Sometimes the challenges these cakes provide me are frustrating and I want to quit but I would hate to ever disappoint. I remember being that child and my face lighting up when I saw what was made just for me. So I take each challenge head on and, thankfully, make some wonderful creations! Some days it is a true labor of love. Side Note: My dad was a radio operator in the Navy. When he left the Navy he began working with Ma Bell in the Washington DC Area. Due to his security clearance in the Navy he was assigned to work with many businesses that required high security clearances. He even was on assignment at B’nai B’rith when a hostage situation occurred. Because my dad was already working on the phone lines he was able to crawl within the ceilings of the building and make contact with the authorities on the outside. Thankfully the situation was diffused within the same afternoon with no casualties that I know of. When my dad was not working he enjoyed time with his family and activities he thought strengthened his family from Boy Scouts to baking cakes. He knew that his day job as a “telephone man” was what paid our bills so he took Wilton classes to further one of his passions. Sometimes our passions are not what pays the bills but rather what helps make life special. 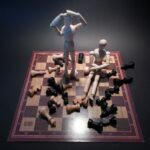 We may not be able to live our passions in the same way that actors, singers, or other talented artists do but that does not make our passions any less valid or worthy. We should be proud of what we accomplish in life and my dad truly loved being a telephone man with layers not everyone would guess. Recipes that I use often come from one of several places: our family cook book (an assemblage of tattered published cookbooks, note cards and yellowed paper with hand written recipes), my favorite cookbooks, the internet (I love the foodnetwork app!) and memory (as some recipes were passed down via learning them at the stove with a particular relative). While I cook often, what I do not consider myself is a Crock Pot Chef. There is nothing wrong with Crock Pot cooking, I am just not a very good Crock Pot cook myself and cooking this way is a little out of my comfort zone. I do own a Crock Pot and I use it most often at family gatherings for our teenie weenie and meatball concoctions. 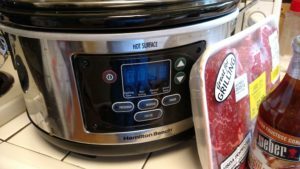 My mom’s smaller Crock Pot I have used to make up my family’s favorite game day cheese dip. When I have tried to make other Crock Pot recipes I have had such mixed results from over cooked meat, burnt homemade jam or fruit butter, and a very rare roast which was slow cooked for eight hours but still very pink and red inside with a dry/tough exterior! Other then those few items mentioned above, I have one very tried and true Crock Pot recipe that I use and that is my Crock Pot Ribs. Like most recipes for me, this one is a smash up of several recipes I have read online over the years. The marinade for the ribs is one I use often when I am making up roast or brisket and I found it just really makes the ribs that much more tender. Since I hate waste (even with marinades! ), I have found that I make a pretty good gravy from the marinade recipe. I then use the gravy for a meal later that week. The gravy goes well with a variety of meals from hamburger steak to smothered potatoes. Enjoy! So that’s it, my one very good Crock Pot recipe. Why would I share that I am awful with cooking Crock Pot food when I could so easily share lots of success stories? I think it’s a good to admit when you aren’t so great at something. It not only gives someone else a chance to shine but lets others know you realize you are less then perfect at something and could use help from others. The other big reason is that I am currently on a mission to find Crock Pot recipes that friends and family have used and loved. With being a foster parent I have found that a lot of birth families lack the skill to create homemade meals and I have been trying to help those families realize cooking is not such a scary thing. I have turned a family cookbook project of tried and true family recipes into a file that I can easily share with anyone interested in learning how to prepare basic meals. What that file lacks are Crock pot recipes. That hasn’t bothered me in the past but right now I have a single mother who wants to prepare home cooked meals but lacks the time for lengthy food and meal preparation. So I have turned to my friends and family for some of their favorite recipes. By garnering recipes that friends and family have used (and loved! ), I feel that I am able to pass along solid recipes to these cooking beginners. The hope is these families will gain confidence that that they can provide without feeling too stressed. Have a favorite Crock Pot recipe? Please share! *Both of these items can be omitted if you do not like the flavor of either ingredient. ** When I am in a hurry and do not want to use fresh garlic I sub out fresh for either 1 tablespoon of minced garlic or 1 teaspoon of garlic powder. *** This marinade recipe can be used for ribs, brisket, roast and even steak! **** The purpose of the marinade is to make sure all of the meat is covered in the liquid. If I find that the liquid does not cover the meat in the container (or ziplock bag) I am using then I add up to 1 cup of water so the meat is fully submerged. HOWEVER if you are using more then 3 pounds of beef you will want to double your marinade so the flavor is not watered down. Mix all of the marinade ingredients and pour over the beef in a storage container or zip lock bag. Place in refrigerator and let rest for 24 to 48 hours. Then prepare meat according to directions. * I either make my own or use a BBQ sauce that is free of High Fructose Corn Syrup as I have trouble digesting things made with this ingredient. Place ribs in the Crock Pot. Add 1 cup of the marinade (set the rest aside for a gravy recipe below) and an entire bottle of BBQ Sauce (approximately 18 ounces). Ribs can either be cooked either on high heat for 3 hours* or low heat for 6 hours* in a Crock Pot. Set your heat option and timer (if you have Crock Pot with a timer). * Cooking times may vary for different Crock Pots. OPTIONAL: An hour before the timer is to go off or about 30 minutes prior to serving (if you have set your food to cook while you are gone), check the consistency of the sauce in the Crock Pot. If the sauce is very thing and runny and you want it to be thicker, mix 2 tablespoons of corn starch with ¼ cup of water and add to the crock pot. If the Crock Pot has changed over to the warm function turn it back to high heat for 30 minutes to allow sauce to thicken, otherwise let it remain on low heat for the last hour it is cooking. This should thicken up the BBQ sauce. Mix the cornstarch with the ¼ cup of water and add to the simmering marinade. Stir constantly over medium heat. Once the mixture begins to thicken turn the stove off and remove from heat. Ready to serve or to let cool down for storage.